¡Exacto! is an accessible guide to Spanish grammar. Using an appealing visual layout, the essentials of Spanish grammar are presented in tables and charts allowing learners to navigate the information easily and view explanations, examples of usage and any exceptions to the rule at a glance. An answer key making it ideal for self-study. 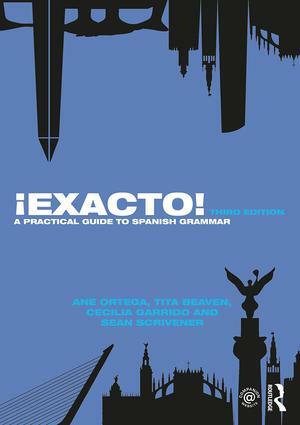 Suitable for class use and independent study, this new edition of ¡Exacto! is the ideal grammar reference and practice resource for all learners of Spanish, from beginners to advanced students. Ane Ortega was a lecturer in Spanish at The Open University, UK, and is currently a lecturer in Language Education at the Begoñako Andra Mari Teacher Training University College of Bilbao, Spain. Tita Beaven is a senior lecturer in Spanish at The Open University. Cecilia Garrido was for many years a senior lecturer in Spanish at The Open University. She retired from the University in 2015. Sean Scrivener is an editor attached to the School of Languages and Applied Linguistics at The Open University.